Cristina is Italian, lives in Brussels, and has been an enthusiastic reader since the age of three. She likes to combine books and travelling, and would find any city trip incomplete without a visit to one or (preferably) more local bookshops. 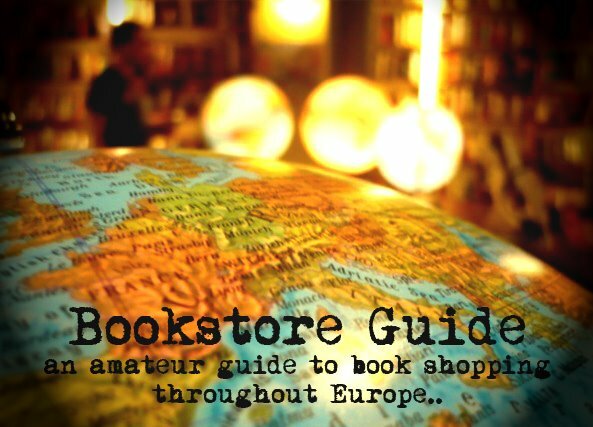 What else could she do but contribute to Bookstore Guide? It's been a while since we've added an article and we have to say that we've been especially looking forward to this one. 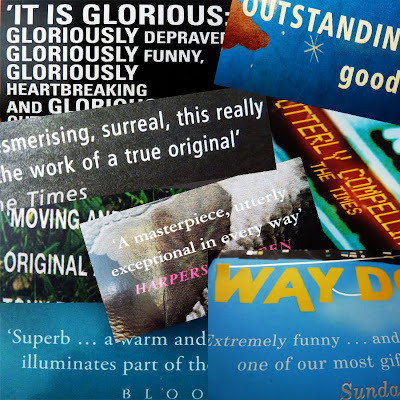 The whole idea came from our friend and Bookstore Guide contributor Cristina Cona who sent us a link to this great article about the history of blurbs which appeared in The Millions back in February. Cristina to BSG: "Now, blurbs: I don’t know how you feel about them, but if there is ONE thing that puts me off buying a book it’s seeing, on its cover, the kind of gushing tripe that publishers feel they have to provide by way of a recommendation. You know, things like “magnificent”, “exquisite”, “dazzlingly evocative”, “utterly haunting”, when all they mean is “this book is OK”. My pet hates are “a tour de force” and “s/he writes like an angel”: oh PUH-LEEZ !!!" 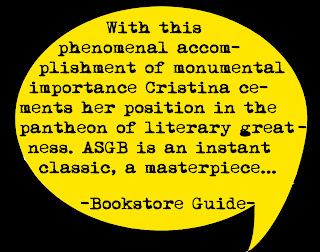 In case you were wondering - we feel just the same... After a few funny emails we found out that Cristina's interest in this topic motivated her to create her very own Automatic Style Generator for Blurbs (ASGB) which will surely put many professional blurb writers out of work. 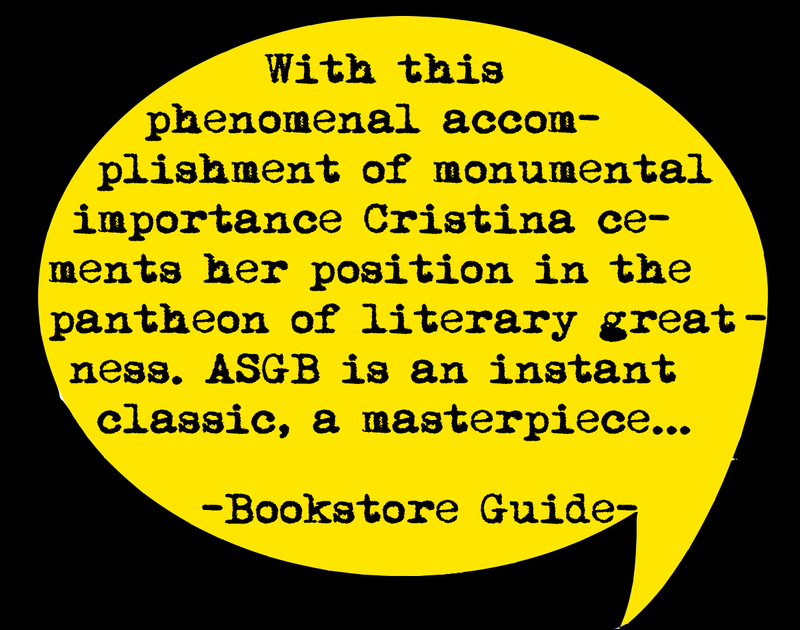 So without further ado, we proudly present the utterly dazzling Automatic Style Generator for Blurbs in world premiere right here on Bookstore Guide! Does this sound too pompous? Well it should, this is an article about blurbs after all! By combining any one of the six cells in the first column with any one of the six cells in each of the columns 2,3,4,5 and 6, you can generate the perfect blurb, time and time again. No need to read the books! Exquisite, riveting, awesome. A masterpiece. An author of such monumental storytelling prowess, the only meaningful comparison we can draw is one with Tolstoy. Like him, X (insert name of author) is one of those (increasinglyrare) writers who manage to convey all the bewildering complexity of the world as we find it, with enviable poise, an unfailing ear for dialogue,and an unequalled lyric touch. This is the novel of the century. It will change your life in more ways than one. An utterly dazzling page- turner. Faced with such a phenomenal accomplishment, one is irresistibly reminded of Proust. The same unerring touch, wealth of imaginative detail and seductive narrative impulse combine to fashion an indelible portrait of our times with an insider’s knowledge of what it really means to be alive. Nobody could write this stuff without a degree of awareness that borders on the divine. Heart-stoppingly beautiful. X (insert name of author) writes like an angel. Reading this luscious, unputdownable book is akin to revisiting the best of Joyce. Both authors bring to the page a rare, lucid, gracious wisdom and a sharpness of textual exploration that enable them to a unique degree to handle (and celebrate) the most intractable challenges and existential concerns with a quiet power of description, an instinctive apprehension of the most finite nuances of behaviour, a sensitivity to compositional values, that literally bowl you over. This is one of contemporary literature’s most dazzling works ofgenius, staggering in its relentless focus on the postmodern Zeitgeist, yet intensely readable. A stunning tour de force. Self-evidently a modern classic. It made me laugh and cry by turns until I could laugh and cry no more – a reaction I’d only ever had before when reading (or should I say: conversing with?) Nabokov. Such giants of literature never fail to conjure up a tirelessly magical atmosphere where the music of perfectly articulated rhythms and cadences unfolds to shed new and memorable light on life as a quest and on literature as a testament to the power of memory, with a mystically suffused, compassionate, in-depth exploration of what goes into the heart of human relationships. If you read only one book this year, do yourself a favour and make sure it is (insert title). Brilliantly evocative, powerfully atmospheric. An amazing combination of richly multilayered texture and sublime delicacy - we hadn’t seen anything like it since George Eliot. You can feel her hand in the sheer narrative drive, the dazzling fluidity of style, the seemingly effortless ability to conjure up a feast of epiphanies that instantly enlighten, disturb and enthrall with astounding turns of phrase such as will inevitably resonate with the reader as infinitely precious verbal dreamscapes. I could truthfully say that I hadn’t enjoyed a novel so much in years. But then, this is more than just a novel: it is the place where heaven and earth meet. Or collide. Compelling to a nail-biting degree, and almost unbearably moving. So masterfully written, so rich and vibrant a tale; such an unerring gift for characterisation; such astonishing insights into what it means to construct an ethos for the 21st century – a talent to match the mindset of Musil, in whose footsteps X (insert name of author) follows, not last in his/her magnificent knack for dialogue and uncanny power to weave a seamless texture of images that engage the reader’s emotions to an almost supernatural degree, spinning a wistful, consistent parable with a refreshing mixture of lightness and meaning, zest and impish humour, elegance and meticulous crafting. Reading these miraculous pages, you’ll have to remind yourself to keep breathing.